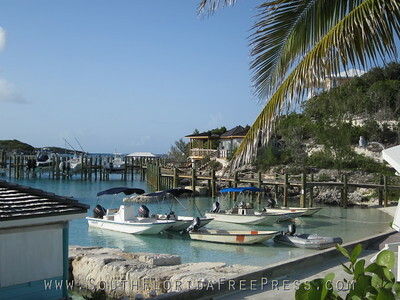 The area around Staniel Cay also features the swimming pigs of Big Major Cay, petting the Nurse Sharks at Compass Cay, feeding the iguanas at Bitter Guana Cay and some top-notch shallow water fishing. Despite the areas seclusion and lack of development you will really have a ton of things to do while creating some life-long memories. 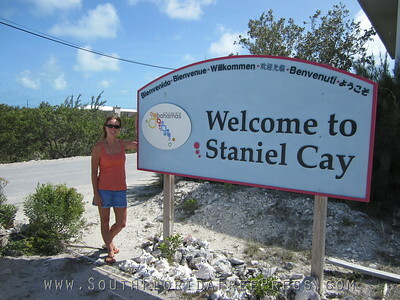 The Exuma Cays are a magical place and Staniel Cay is the hub, and the hub of Staniel Cay is the yacht club and bar. Go visit this little spot of paradise and you will see for yourself just how special it really is. Now it was time to go exploring. Any visitor to Staniel Cay can tell you there is much to be explored, both on the shores of the island and on the many surrounding cays. 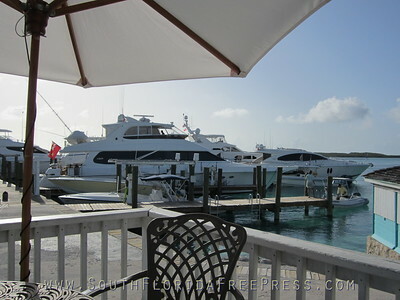 The Staniel Cay Yacht Club has several amenities that make that exploration a pleasure. First and foremost are the fleet of 13 foot Boston Whalers available to visitors, each boat is slightly different than the next (some have steering wheels, some you steer with the motor), but each one is in good shape and can get you where you want to go. 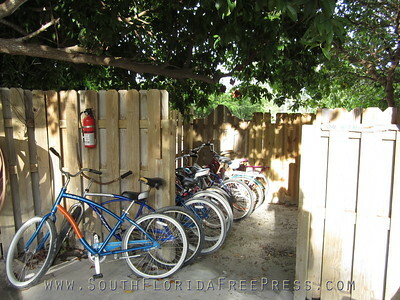 Also on hand are bicycles, golf carts, kayaks, snorkel gear, scuba tanks, and personal guides. Each of these things can be rented a la carte, or you can purchase a package rate which includes your cottage stay, three meals a day, daily use of the boat--fuel included, kayaks, and bicycle use. We elected to purchase the package deal at a rate of $173.00 per person. We hopped in a boat and headed for the closest attraction—Thunderball Grotto. The Grotto is a small, partially underwater cavern with a sky-light, which is accessible to snorkelers at low tide. It was made famous by the James Bond movie Thunderball; you can see pictures from the filming of the movie at the SCYC bar. Getting inside the grotto is at first a little intimidating, but if you go at low tide you don’t even have to put your head under water to gain entrance, just find the opening and guide yourself in using your hands as a brace against the sides of the rocky cave. Once you are inside Thunderball you will be amazed! Any fear you might have had will instantly be replaced by awe when you enter the interior. Inside the cave the light beams down from the opening in the roof, illuminating the crystal clear blue water below. The light beam penetrates the surface of the water and dances all the way to the ocean floor 20 feet below, a myriad of tropical fish dart in and out of the light, their bright colors flashing in the sun. Among the colorful parade are queen angelfish, sergeant majors, rock beauties, grouper, blue chromis, snapper, and parrotfish. 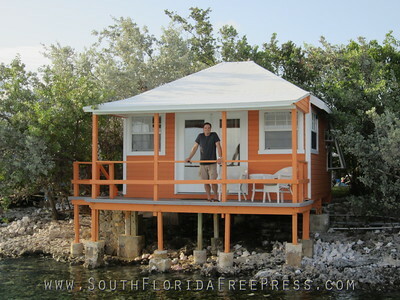 The next stop on our adventure was Big Major Cay, home of the famous swimming pigs. Yes you read that right, swimming pigs! We counted six pigs that have made this small island their home, and each one has become accustomed to the fact that visitors most likely mean food. So when they a see a boat floating up to shore they know it means a handout, and so they will swim out to beg. It is the coolest and craziest thing I have ever seen! Pigs in paradise—you gotta love it! Oh, there are also stray cats on the island, so be sure to bring them a little snack and some fresh water too. 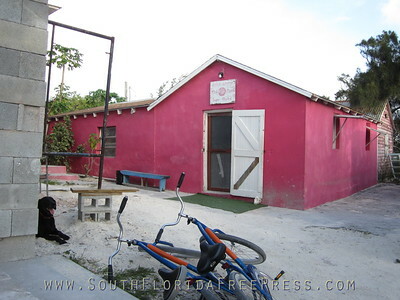 The staff of the SCYC kitchen will give you table scraps to feed to the residents of Big Major Cay…just ask. We took some sardines for the cats, and some bread for the pigs, and had fun being “chased” down the beach by hungry piggies; a must do if you visit the Exumas. 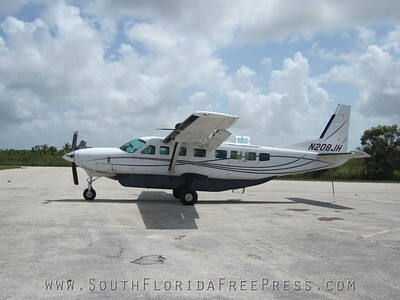 The Exuma Land and Sea Park was our destination for the day. The park headquarters is located on the island of Warderick Wells, approximately 22 miles away…too far to travel in the Boston Whaler, so we needed a guide. We asked at the bar and were introduced to Raymond Andrews, one of the coolest guys in the Bahamas. He agreed to take us out for the day and show us his beautiful country. A guide to the park usually costs around $400.00, but it is possible to get deals, so don’t be afraid to ask. We left for the park in Raymond’s 17 foot boat at 10:00 a.m., the boat ride was spectacular! Raymond is a great driver and an informative guide, the ride was smooth and fast and he always pointed out the points of interest, including Johnny Depp’s private cay. Be sure to ask for Raymond if you want an exceptional guide, or you can also contact him personally for private trips by phone at these numbers (Home 1-242-355-3070 or cell 1-242-464-1181). 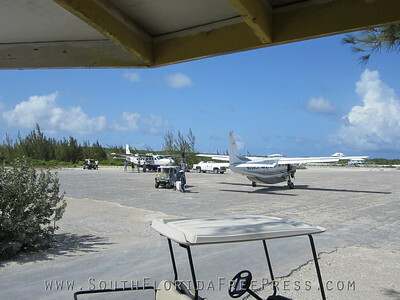 Another added bonus to our park trip was our stop at Compass Cay. One of the highlights of this private island is a chance to swim with the resident nurse sharks. Getting in the water with these non-aggressive sharks is quite a thrill, but if that is not your style, you can still enjoy the sharks from topside by petting or feeding them. 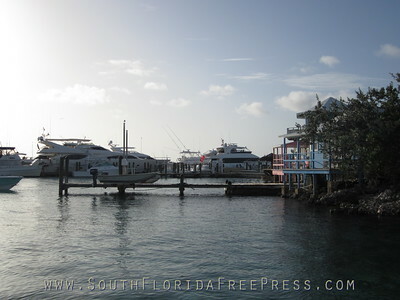 While docked at Compass Cay we found out that it is possible for individuals, not with a guide, to stop and tie up to the dock for a $5.00 fee. This sounded like a great idea, especially since the island has a hiking trail that leads to a blue lagoon, perfect for swimming, called Rachel’s Bubble Bath. We decided then and there to return in our Boston Whaler. The next morning we made our way back to Compass Cay to swim with the sharks again, and to hike to Rachel’s Bubble Bath. Our friend Michele, at the Compass Cay marina shop, sold us a map of the island that laid out the trail to the bath, and set us on our way. The sun was shining down with intensity, making the swim in the bubble bath even more rewarding after a long hike. The pool, known as Rachel’s Bubble Bath, gets its name from the action of the waves. The serene pool is separated from the ocean by a rocky outcrop, but at mid to high tide the waves get high enough to crash over the rocks and into the lagoon, creating bubbles of white foam much like a natural Jacuzzi. Swimming and diving into the pool from the rocks above is a total blast! Remember, if you dive off the rocks you have to time your leap perfectly or you just might get slammed by a rogue wave, so be careful. Once we had enjoyed a nice swim in the bath we hiked back to the marina. Waiting in our boat was a cooler from the SCYC kitchen, if you know you are going to spend the day in your boat the staff will pack you a lunch, complete with beach umbrella, so that you can stop on any island and enjoy your own private paradise. 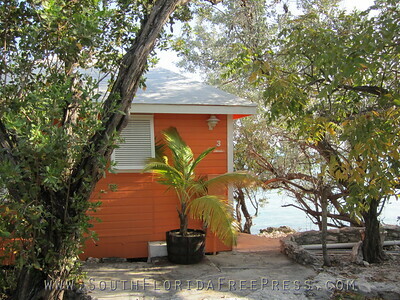 There are so many beautiful islands in the Exuma chain that it is easy to find your own secluded spot. We picked a nice beach and enjoyed our lunch under the shade of the umbrella. 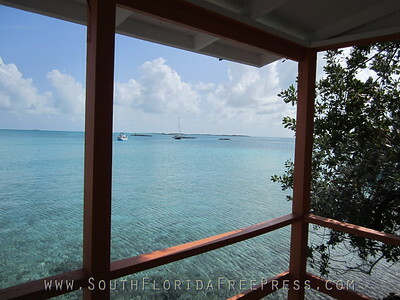 Then it was back to Staniel Cay to enjoy the view from our porch until the dinner bell rang. We made it back to Staniel Cay at 3:00 p.m., just in time for a late lunch. Afterwards, there was still a few hours of daylight left so we jumped in the Whaler and cruised to another nearby island called Bitter Guana Cay. Inhabiting the small island are several endangered rock iguanas that will come running out to any visitor for a handout. The staff at SCYC told us it was legal to feed them, so we made sure to bring them a few scraps from the kitchen. The lizards might not be as intimidating as the sharks, but it still gets your adrenaline pumping when a five foot long iguana comes running down the beach to eat out of your hand. After playing with the iguanas for awhile we set out to explore the island, as we walked toward the end of the beach towards some amazingly white limestone cliffs we were surprised by, of all things, a barn owl that flew out of a cave-like recess! 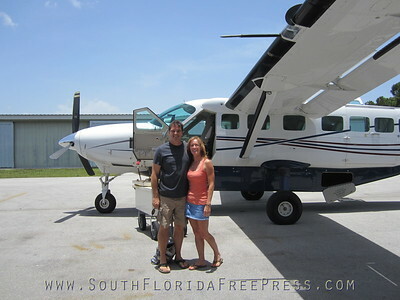 We couldn’t believe our eyes, who would have thought an owl would be in the Bahamas…I guess they like to getaway too. There’s a really nice walk/hike — you cross the island north of the airstrip on paved/dirt roads & watch for the sign that says “beaches” — then follow the trail until you find this trail branching off. It follows the spectacular rocky shoreline and has some beautiful vistas. We enjoyed it immensely and consider it a “don’t miss”! Afterward, you can return via the trail or follow the small road behind the under construction house back down the other side of the island & have a nice cold one at the yacht club bar to quench your thirst!The rocky shoreline was alive with crashing waves and salt spray. Mezmerizing to watch. The walk itself was on rocky sharp pointy rocks – my crocs were definitely not the right choice of shoe, but we thought it was a sand trail. And it was for awhile. 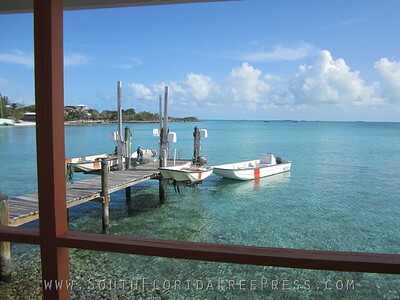 Note to self — anytime you decide to try a “walk” in the Exumas, put on more sturdy shoes than crocs! The treasure found along this beautiful hike is more of the scenic variety, rather than a pirate’s loot stashed in a cove, but if you hike this secluded trail you will nonetheless be rewarded. Situated on the south western corner of a small island called Staniel Cay, Pirate’s Cove offers so many great opportunities for hikers—sandy beaches, towering limestone cliffs that drop straight down to the ocean and serene lagoons perfect for swimming can all be found along this amazing hike. The hike begins at Pirate Cove Beach, a beautiful stretch of sand perfect for sunbathing, and then heads for the limestone cliffs that shelter the beach from the open ocean. Take any path that leads up the side of the cliff (look closely and you will see cairns marking the way) and you will soon be staring down at the crashing ocean waves. Spend some time enjoying the spectacular view, and then head down the far side of the cliff to a small cove. 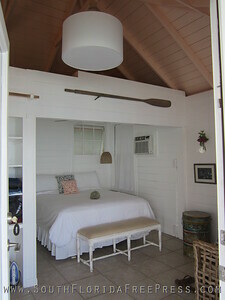 It is here where you will be rewarded with a fantastic aquamarine pool that is just perfect for a swim.